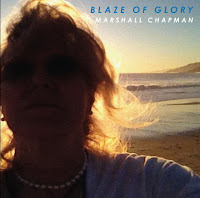 JP's Music Blog: CD Review: Marshall Chapman Fires Off A "Blaze Of Glory"
CD Review: Marshall Chapman Fires Off A "Blaze Of Glory"
Singer/songwriter Marshall Chapman recently released her 13th album entitled "Blaze of Glory" through TallGirl records. For those that may not know Marshall Chapman, she is an entertainment chameleon. Not only is she an outstanding songwriter who has had her songs covered by Emmylou Harris and Joe Cocker, but she has also starred in the Broadway musical Good Ol' Girls and acted in the big budget picture Country Strong. But Chapman says that music is her "first and last love." Her new album begins with Chapman trading vocal duties with Todd Snider on the guitar boogie shuffle of "Love In The Wind." She gets some exceptional help on this new album from established guitarist Wil Kimbrough and the rhythm section of Jim Mayer (bass) and Casey Wood (drums). Chapman gets a little bluesy on the slow romp of "Nearness of You" keeps the tempo to a minimum in "Beyond Words." The country fun of "Making Waves" and the slinky jazz of "Call The Lamas" shows the diversity in her songwriting, while keeping the listener hanging on every word. The album closes with "Blaze of Glory" which sounds as if it was supposed to be autobiographical. To find out more about Marshall Chapman and her new album, please visit tallgirl.com.